Gold has been in circulation for over 6000 years. Civilizations have used it as a form of money, jewelry, and gold has had many industrial applications. As one of the oldest forms of money, gold continues to be used and traded as an asset of real value. Gold is by far one of the best if not the best asset to use for collateral pawn loans. With gold trading around $1600 per troy ounce customers can easily sell their gold or get the pawn loans they need with only a small amount of Gold. 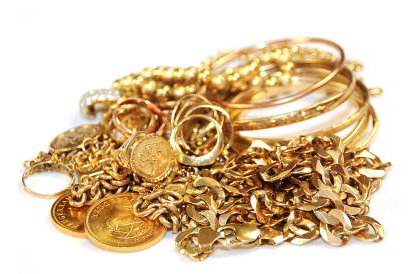 We will consider a wide range of gold items so if you want to sell gold coins, or jewelry, please come in and see us. If you want to invest in Gold, you can buy gold coins from our stock. Hat City Pawn prides itself on offering customers competitive prices on their gold. We strive to offer the best prices in town, come in today and receive a free no obligation quote for your gold. Copyright © 2019 Hat City Pawn All rights reserved.